Bask in the Fun of Masks! You already love creating artwork to preserve memories, but what about using artwork to make memories? 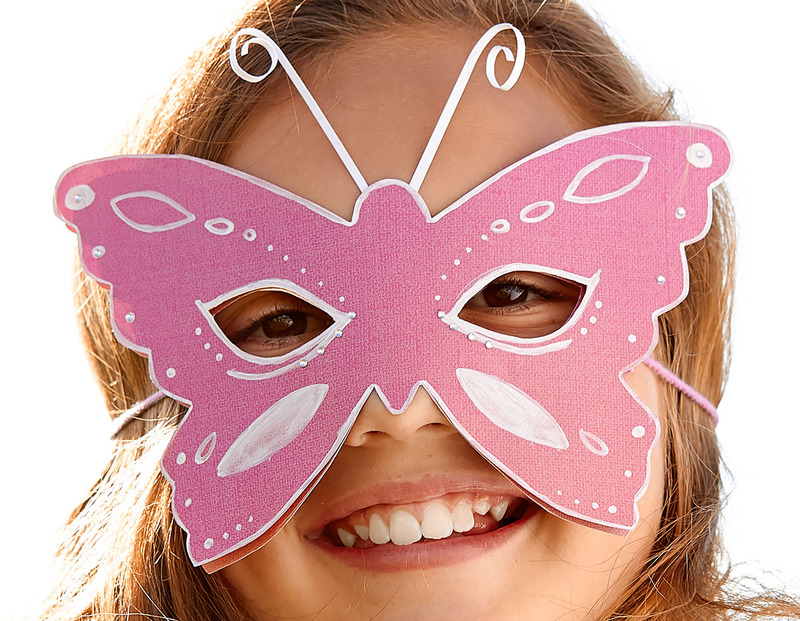 We’ll show you one of our favorite ways to do just that: handcrafted masks! 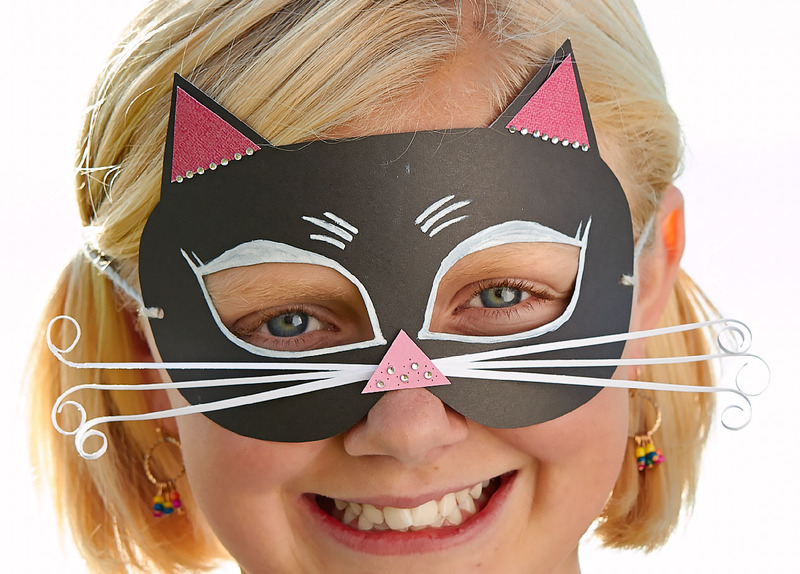 Kids will love donning these masks for costume parties, impromptu plays, and games of dress-up. And why should they be the only ones? The masks make us want to waltz to the orchestra music at a masquerade ball, too! They’d be perfect for a last-second costume, as you can choose papers that coordinate with your favorite outfit to craft a mask that will unify the whole ensemble! 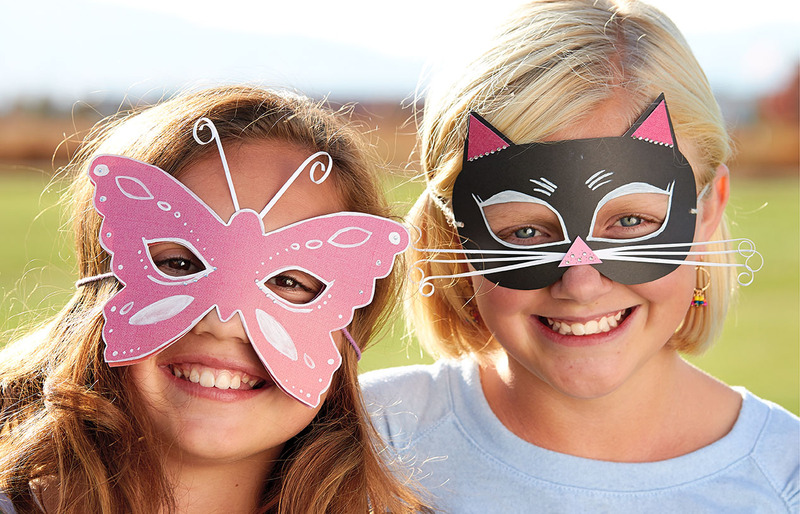 Whether for special occasions or everyday moments, these masks will add some flair to your fun! Are you wondering how our artist got the white designs to show up, even on the Black cardstock? The answer: our chalk marker! It may take a few coats, but this ink will decorate even your darkest papers. What a cool tool, eh? Just “chalk” it up to our passion for exciting products! And did you notice the darling curls at the end of the cat’s whiskers and the butterfly’s antennae? You can thank the wonderful quilling tool for that! For those less familiar with the technique, the quilling tool is a stylus with a small slot at the top. Slip a strip of paper into the slot and the tool will grip it as you twist the paper around the quilling tool. Twirl it as tightly as you like, and enjoy the resulting curls! Doesn’t the butterfly mask look like it’s ready to take flight? The credit for that goes to the three-dimensional effect our artist used on this mask. To create this look, she first cut two identical shapes from the Pomegranate ombre B&T Duos™ paper featured in Sangria. Next, she decorated the top layer with the chalk marker and bitty sparkles. (That was the fun part!) She finished by attaching the embellished layer to the bottom one with some 3-D foam tape. Beautifully simple, right? 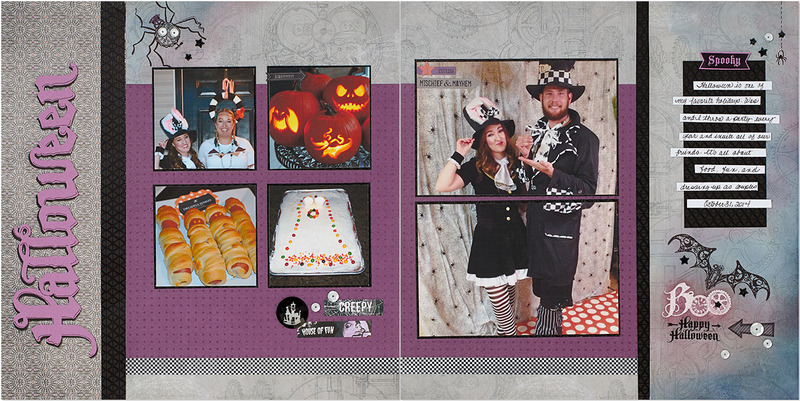 Make Your Halloween Party Spooktacular! Halloween may have crept up on you, but not to fear! 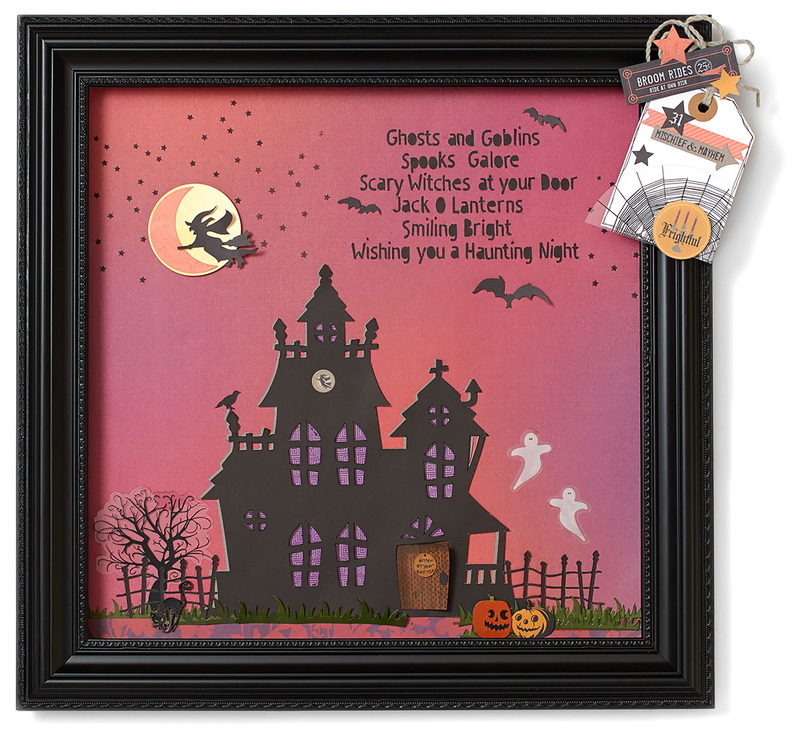 There is still time to make some very cool decorations for your Halloween bash! 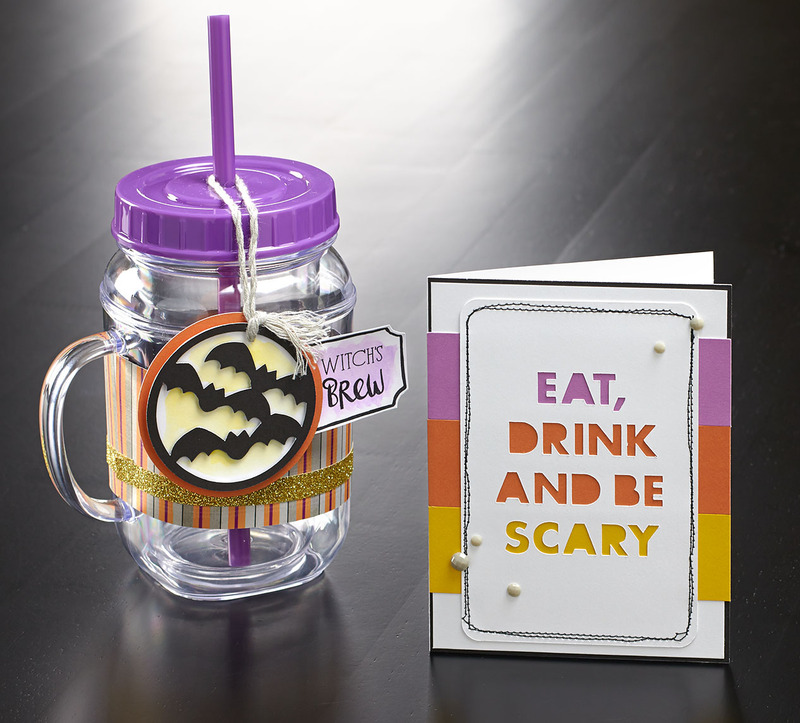 Invite your guests to the party with this “Eat, Drink, and Be Scary” card, which is quick and easy to make with the help of the Cricut® Artfully Sent Collection! Dress up a mug with Nevermore paper and some spooky Cricut®-cut shapes for a perfectly-coordinating party favor to give your guests. 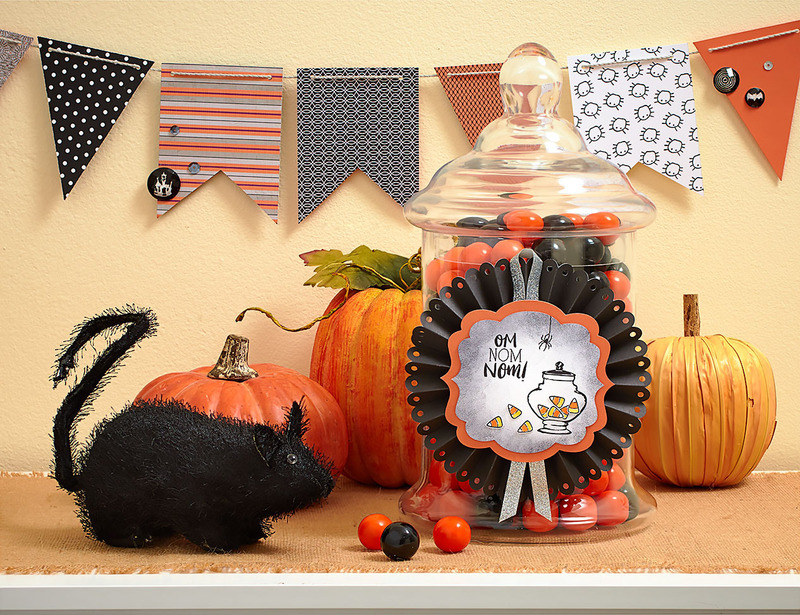 The My Acrylix® Tasty Terrors stamp set is the star of this dainty witch hat décor piece. 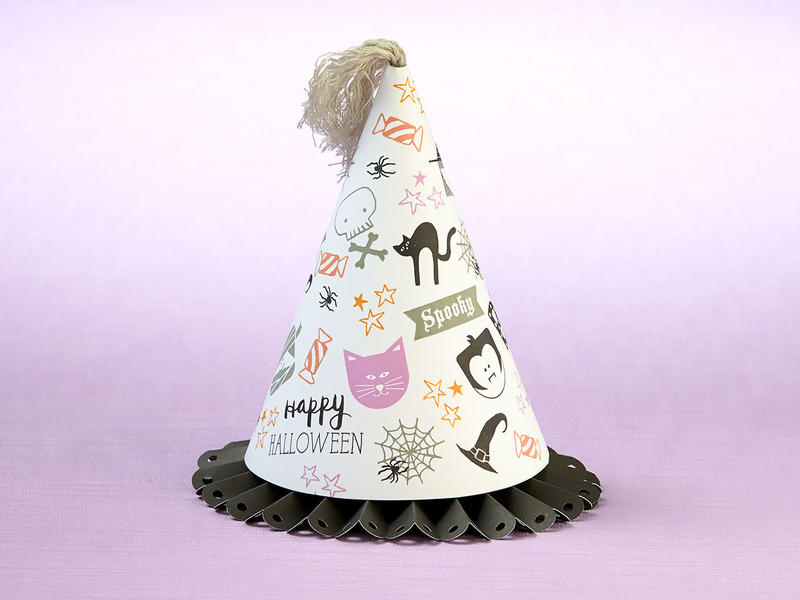 The hat itself is simple to make using shapes cut with your Cricut® Artiste Collection, giving you lots of time to enjoy stamping your own spooky design. Whisper thick twine makes a terrific tassel to finish off the piece. No Halloween party is complete without some candy. Dress up your jars of goodies with more stamped artwork! 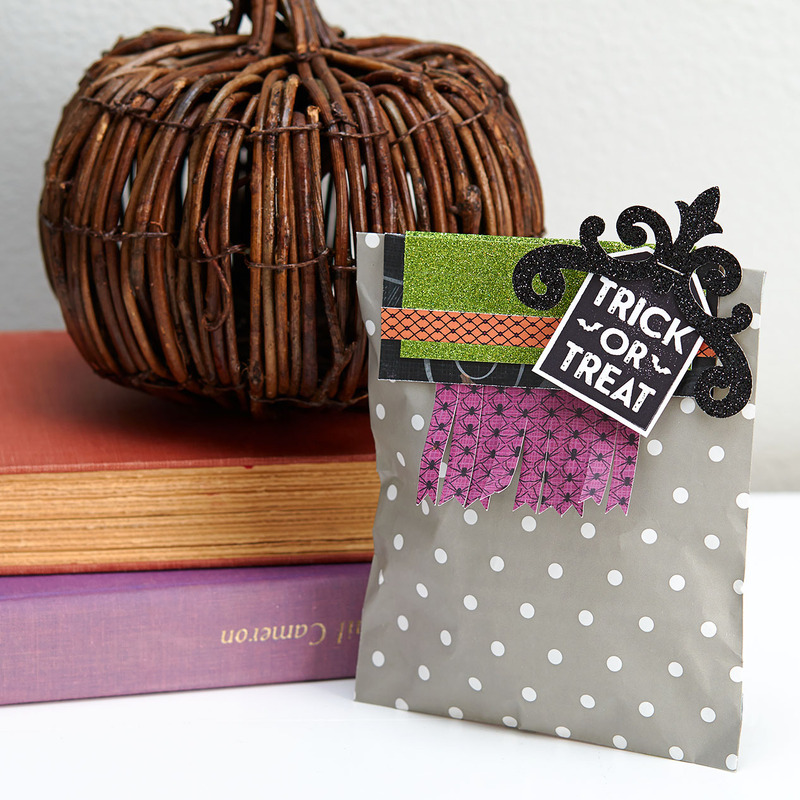 To create that distressed look on the White Cardstock, use sponge daubers and Black ink. 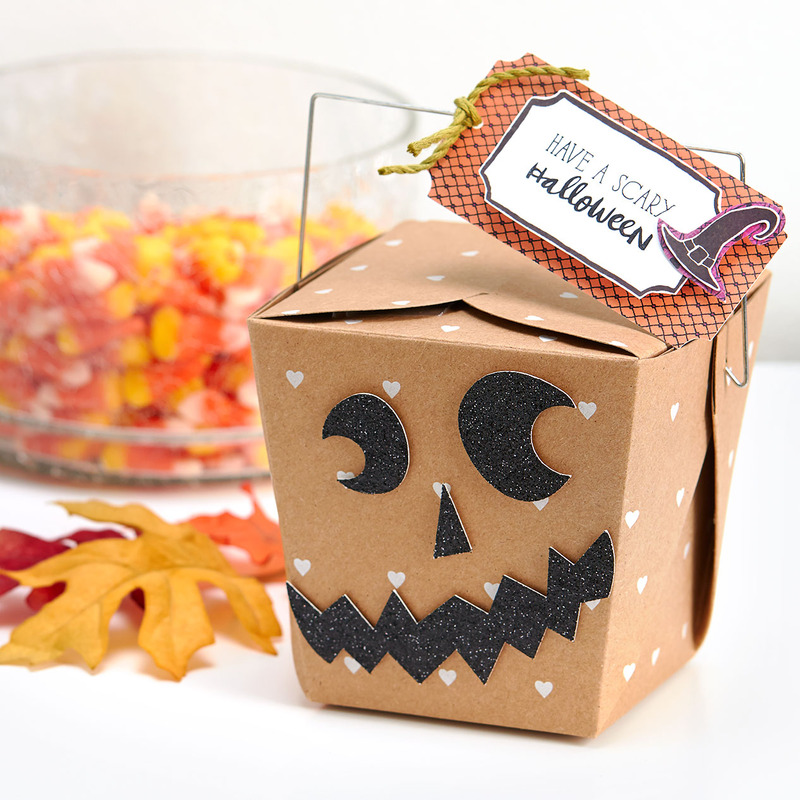 For the candy corn images, use watercolor paints to easily add the yellow and orange stripes. Just remember to use Archival Black Exclusive Inks™ stamp pad when stamping the images so your ink doesn’t bleed! 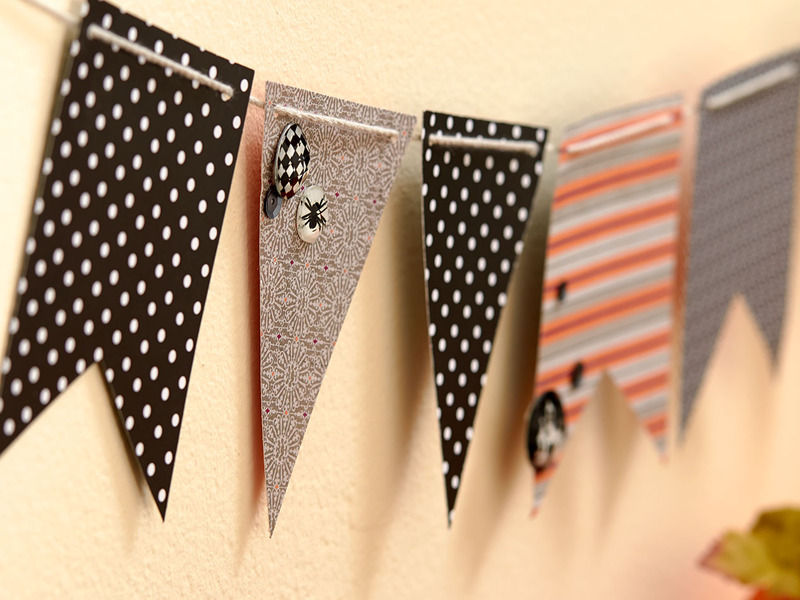 One of the easiest party decorations to make is a decorative banner. It’s a party essential, and instantly makes any party more fabulous! This one features colored cardstock, paper from our Nevermore and La Vie En Rose paper packets, and White Daisy cardstock we have decorated using stamps. Add the Nevermore Assortment and the sequins silver assortment into the mix for extra drama. Lastly, we’re going to give you some tips for creating a more elaborate piece of Halloween décor, which many of you loved on our Facebook page! This piece features several Cricut® cut pieces: two haunted houses (one in Black and one in Whisper, for a haunting shadow effect), two fences, one crow, three strips of grass, one tag, one circle (transformed into a moon with some watercolors), and the letters for the spooky poem—these letters were cut out of the Sangria ombre paper and then backed with Black cardstock. You’ll find the sizes our artist used in the recipe list at the end of this post. Nevermore Complements are used all over the project. Some, like the witch and the spooky tree, are used exactly as they come; others, like the black cat and one of the jack-o-lanterns, are slightly altered, having been trimmed out of larger pieces from the Complements. The stars in the sky were stamped on using the My Acrylix® Charming Cascades stamp set. And finally, that creepy door is a piece of Desert Sand B&T Duos™ paper from the Sangria paper packet. Our artist colored it with the ShinHan™ Touch Twin™ Clay marker and hung a hand-lettered sign on it. There—you now have several different décor ideas for all your spooky celebrations. Whether you choose just one or two to make or create them all, they are sure to make your party a smash! Happy crafting! Just look at that face! Isn’t he sweet? Halloween is such a fun time for children, but it’s also fun for adults to dress up their kiddos—or puppies!—in cute costumes. Their personalities really come to life! Scrapbook pages like this remind us to celebrate childhood and enjoy time together with loved ones. Now, did you spot today’s stamping technique? 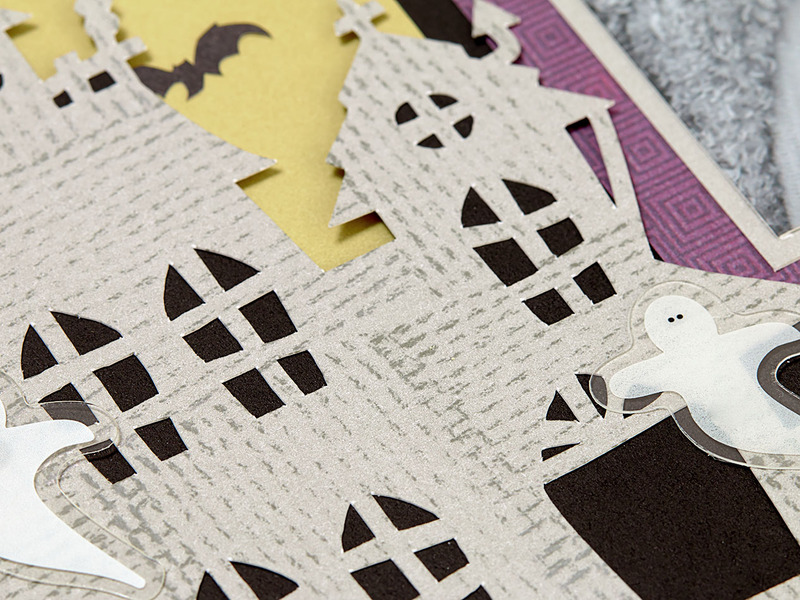 You can find it by taking a closer look at the Cricut®-cut haunted house. We’re going to tell you how to create that textured look you see on the shape. It’s really simple! Start with some twine. Wrap it around a My Acrylix® block a few times but not too many: You don’t want the block to look like a mummy! 🙂 Tie a knot at the top of the block to secure the twine, and there you have it! You’ve created your own unique texture stamp! 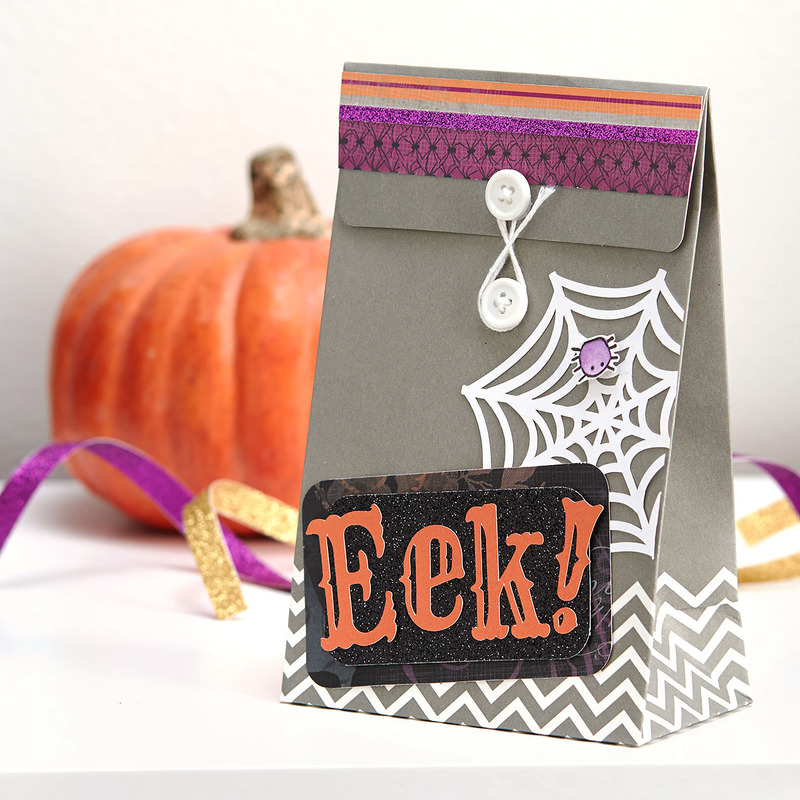 Now ink the twine with our Black Exclusive Inks™ stamp pad, and stamp it down onto the haunted house shape. Feel free to alternate horizontal and vertical lines to add even more visual interest. Thanks for joining us this month as we’ve shared some stamping ideas to spice up your crafting routine. For more Nevermore inspiration, be sure to search #ctmhnevermore on social media. Once you create your own masterpiece, share it with the world by using the same hashtag. We love seeing what you create! National Stamping Month’s been a real treat: From designing the My Acrylix® Hello, Life! stamp sets to looking at all the beautiful artwork you’ve shared on social media, we’ve enjoyed every moment of it! Ready for another great stamping technique to celebrate this special month? 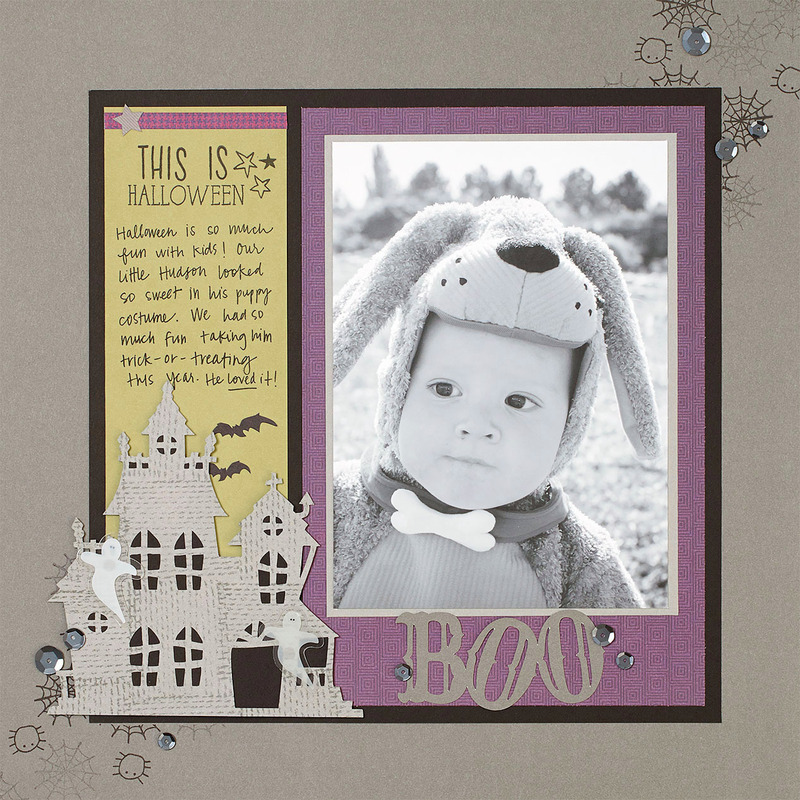 We’ve got a great one to share from this spooktacular layout! Did that “BOO” stamp on the right page pop out at you? Well it should have, not because it’s scary but because it’s embossed! For those who don’t know what we mean by embossing, we’ll quickly explain. Embossing means to create a raised design on a surface. This stamping technique gives the stamp a gritty texture that sits on top of the page for added dimension. 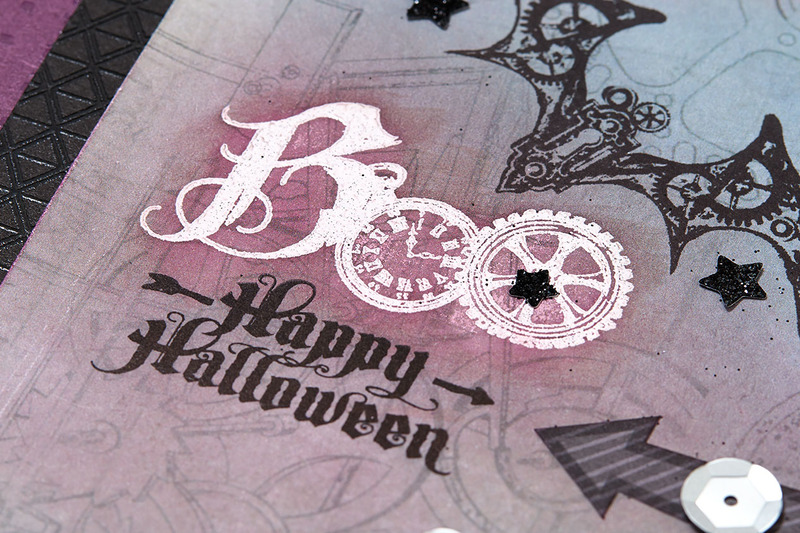 What’s particularly cool about the embossing on this Halloween layout is that our artist surrounded it with an Eggplant fog to create a ghostly feel. This technique is really easy to do and adds extra charm to the embossing. Using our Eggplant Exclusive Inks™ stamp pad, she simply took a sponge dauber and lightly daubed on and around the embossing. The stamp doesn’t become obscured because the embossing resists the ink. It’s almost like magic! Convention is coming! Convention is coming! One of everyone’s favorite things about Convention is having the chance to see the newest products in an up-close and personal setting. Nowhere does this happen like it does at Extravaganza. At this fast and furious (but super fun) session, everyone gets to see almost every new product used in artwork created by Consultants. These Consultant artists take 20 minutes to teach ideas and techniques they used to create their mini museums of amazing artwork, filling attendees’ heads with an incredible amount of ideas for what to do with all that is new in the annual idea book. It is one of the BEST parts of Convention! At last year’s Extravaganza in Anaheim, some very talented artists showed off their work. Though the products featured here have been around for several months now, the ideas are so fresh, they’ll have you seeing things in a brand new light. Enjoy this little sampling of the awesomeness we saw then, and get excited for the awesomeness we’re going to see again in just a few weeks! Tresa Black created these incredible projects with the pages from My Crush® books, both on and off the page. Sara Batkin took the Base & Bling line by storm by introducing this array of beautiful goodies—some for wearing, others for sharing. Michelle Snyder reminded us of the joy of not only keeping memories, but also of making them with her collection of clever party creations. Exciting? Most definitely! Convention is an event just for Consultants, so sign up to be one yourself! Then YOU will be among the first to see this level of gorgeous artwork and gather inspiring ideas when you attend Convention this year. Not quite sure what to expect at your first Convention? Here’s a look at the fun and creativity that takes place.